For many parents, shopping for kids’ bedding can be a daunting experience. You want a bed that’s free from toxins and is safe for your child, of course. You want a mattress that’s eco-friendly and that won’t cause harm to the planet. However, kids can be tough on a bed! To counter night-time accidents, spills and just normal wear and tear, your child’s mattress should also be durable, stain resistant and affordable. There are plenty of options for eco-friendly, affordable and safe best mattress for kids. From large brands like Avocado Mattress to smaller names like 5 Little Monkeys, our list of the top eco-friendly kids’ beds has something to help every child sleep safely and soundly. Avocado Mattress is, without a doubt, one of our favorite natural mattresses. The bed is free from chemicals and VOCs, it’s Greenguard Gold Certified, eco-INSTITUT Certified and guaranteed to be safe for kids. Handcrafted in the USA, this mattress is going to be a perfect fit for your child as he or she grows. Avocado Natural Mattress is an American company that prides itself in quality, handcrafted beds. Each bed is made to order using 100% natural latex rubber, Joma wool and GOTS Certified organic cotton. Wool is naturally fire retardant, eliminating the need for harmful sprays. Cotton, of course, is breathable and will ensure your little one has a cool, comfy night’s sleep. Avocado Mattress is also a member of 1% for the Planet. Each year, the company donates 1% of all sales to non-profits like American Forests, Oceana and Kula Project. For full details on this company, be sure to check out our in-depth Avocado Mattress review. Avocado Mattress Coupon Code | Use NATURE150 for $150 Off any mattress + Free Shipping - good through April 29th or click the Avocado Mattress Sale for additional offers. The next mattress we love for kids is the PlushBeds mattress. This is another example of a quality bed that’s made in the USA from natural materials. What we love about this mattress is that there are no animal products, like wool, in the bed at all. It’s completely animal-free. The PlushBed is customizable to fit your little one’s preferences. Choose from soft, medium and medium firm in sizes ranging from twin to California king. The bed is sustainably made using renewable latex that’s certified by the Global Organic Latex Standard. Cotton used in the mattress’s construction is certified USDA organic. As we researched for this PlushBed review, we learned that the company supports the Autism Society and other non-profits. We also love that the group sponsors a scholarship program. $1,000 is granted to a student pursuing an “eco-degree” in fields like Marine Biology and Renewable Energy Technology. The Sweet Zzz Mattress is hypoallergenic, which means it’s great for kids. Whether your child has asthma, allergies or neither, the Sweet Zzz Mattress will leave your child breathing easily as she rests. It’s also chemical-free. OEKO-Tex is a third party certifying organization that monitors products for chemicals like lead, mercury and other substances. This mattress is class 1 certified, the highest OEKO-Tex standard. People who have bought the Sweet Zzz Mattress say they love the firmness. The mattress is rated firm, so it’s safe for babies and toddlers. Of course, it’s perfect for older kids, too. Choose from six mattress sizes and enjoy a 100 night sleep trial so you can be sure your child is on the perfect mattress. We felt we should mention in our Sweet Zzz review that the company is a member of 1% for the Planet. They partner with groups like the LA Food Bank and Breast Cancer Research Foundation to give back to the local community. 5 Little Monkeys is a family owned business that’s designed a mattress specifically for children. The bed boasts many features that you – and your child – will love. First, the mattress is created using CertiPUR-US Certified memory foam. That means your mattress is free from lead, heavy metals, formaldehyde and dangerous flame retardants. In other words, it’s a safe mattress for your little ones to rest on. The twin bunk bed mattress is also sold with a waterproof cover. Accidents happen, but you want your mattress to last. The waterproof cover is made from organic jersey knit and protects the bed from spills and other liquids. Along with the mattress cover, the set includes a smaller-sized pillow, perfect for little bodies. 5 Little Monkeys reviews say the mattresses are the perfect firmness for even the tiniest sleepers. It’s also a great bed for temperature regulation and for kids with allergies. Overall, this is one of the best natural mattresses designed specifically for little ones. Naturepedic is a mattress company that specializes in natural, organic and sustainable mattresses. For our Naturepedic review, we’ve chosen to feature the Verse, one of the best mattress for kids available in the marketplace. The mattress is designed with the bigger kid in mind. This mattress is a great “next step” once your child graduates from a toddler bed. Firm support is perfect for little bones, but gives them a little more room to relax at night. The Naturepedic Verse has another interesting feature we like. One side is waterproof, protecting the bed from little kids’ accidents. When your child grows, simply flip the mattress to find a soft, quilted surface. The Verse mattress contains non-GMO materials like GOTS Certified organic cotton and cotton fill. Parents who have gifted children this mattress say it’s ideal for kids who sleep hot. 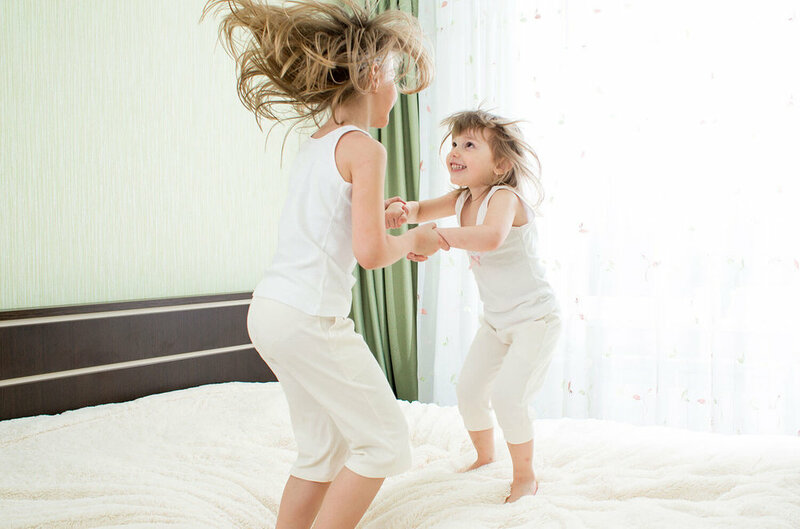 Naturepedic offers a 10 year warranty on the Verse mattress, so the bed will last your children a long time! If you’re looking for an affordable, accessible and natural mattress for your kids, look no further than our Brooklyn Bedding review. Brooklyn Bedding prides itself on creating a bed with superb value. The beds are priced affordably enough that you can even furnish your guest room or your student’s dorm room with eco-friendly, non-toxic mattresses. This memory foam mattress is both recyclable and biodegradable. It’s crafted from CertiPUR-US Certified memory foam, meaning it’s free from harmful chemicals. People who have chosen this bedding solution are pleased that there’s no strange smell from off-gassing. Do you think most memory foam mattresses are hot? Brooklyn Bedding mattresses are different. The beds feature 3 inch layer of patented Energex responsive foam, ensuring your kids sleep comfortable even on warm summer nights. The Brooklyn Bedding bed is compatible with any base at all, including adjustable frames. Brooklyn Bedding Coupon Code | Use code SPRING20 for 20% Off all Mattress - good through April 16th. Live and Sleep is another of our favorite mattress companies. The group designed a mattress that’s not only eco-friendly and safe, but is affordable, too! Like the 5 Little Monkeys mattress, you can furnish your home with a few Live and Sleep mattresses. What we love about Live and Sleep, however, is that you can choose your desired level of firmness. The Live and Sleep mattress is made using CertiPUR-US certified foam and is OEKO-Tex certified. The bed is safe – and comfortable – for your little ones, and for adults, too! Your mattress will come shipped to you in smaller-sized packaging to reduce the carbon footprint. You’ll love that the shipping containers are made from recyclable materials, too. As we researched for our Live and Sleep review, we learned that the company is both eco-friendly and philanthropic. Each quarter, Live and Sleep donates a portion of sales to the National Alliance to End Homelessness. Next on our list of the top eco-friendly kids’ mattresses is our Yoga Sleep review. Yoga Sleep may be a company you’ve not heard of before. They’re a smaller, family-owned business based in North Carolina, and the company actually began as manufacturers of a sound machine. For our review, we’ve chosen the Unplug Mattress. This mattress offers medium firmness so that your children are supported in a healthy way. It’s great for stomach, side or back sleepers and the product features the Thermocool cover, a knit stretch fabric that keeps kids cool at night. The Yoga Sleep Unplug will work with any mattress base including adjustable frames. In addition to eco-friendly, CertiPUR-US Certified beds, Yoga Sleep offers earth-conscious bedding “extras” including a wedge pillow system, wrinkle-free cotton sheets and breathable mattress protectors. Yoga Sleep Coupon Code | No code required for $250 Off any mattress + Free Shipping - good through April 30th. When your child is transitioning from a toddler or crib mattress to a “big kid” bed, you need something that’s durable, hypoallergenic and safe. If this sounds like your family’s needs, this Lifekind review is for you. The Lifekind Youth Bed is a non-toxic, GreenGuard Certified mattress that’s perfect for younger children. The Lifekind Youth Bed is made in the USA from GOTS Certified organic wool and cotton. It features GOLS certified latex, which is sustainable and harvested by hand. Put simply, the Lifekind Youth Bed is one of the safest, cleanest twin bunk bed mattresses on the market. What makes this mattress great as a transitional bed? First, it’s affordable. Even if your child will only need a twin for several years, you can afford to buy this then move it to a guest room when your child grows. Secondly, the mattress is flappable. That said, your child won’t leave an impression after years of use. Finally, the bed is mold- and mildew-resistant, allowing your child to breathe safely. Next on our list of the top eco-friendly kids’ mattresses is our Essentia review. We love the simplicity of this bed; it’s an unassuming, natural and healthy mattress that’s perfect for kids. The bed is made from natural memory foam – there are no animal products used in the construction of this bed. The Essentia Mattress Tatami is our choice for our Essentia review. The bed is firm enough for very young sleepers and appropriate for any sleep position. We also love that the inner layers of the bed don’t include wool and cotton. That makes the bed an unlikely environment for dust mites, creating a hypoallergenic solution. Essentia Coupon Code | No code required for 17% Off Lifestyle, Performance and Wholebody Mattress Collections + Free Shipping - good through April 30th. My Green Mattress is another example of an affordable mattress with sizing options to suit the whole family. Kids will love the springy, medium-firm feel of the Natural Escape, our choice for our My Green Mattress review. This mattress is a latex/coil hybrid, and is completely recyclable! Even the springs will be accepted by recycling centers in most states. In addition to being recyclable, the Natural Escape bed is certified by many organizations you’ll recognize: the wool is GOTS compliant, the latex is GOLS Certified and the bed itself is OEKO-Tex and GreenGuard Gold Certified. While you’re shopping for a My Green Mattress bed, be sure to take a look at the company’s other products. You’ll find a line of mattress toppers and protectors that offer a great way to customize your child’s bed. My Green Mattress Coupon Code | Use GREEN100 for $100 Off any mattress. Nest Bedding is an American company that offers a full line of natural and organic products in its catalog. Organic cotton sheets, sustainable pillows and even natural pet care products are just a sampling of what the company sells. For our Nest Bedding review, we’ve chosen the Hybrid Latex. This bed is available in medium, firm and plush comfort, and is one of the most kid-friendly mattresses available. You’ll appreciate that the mattress is made in the USA, and that it’s comprised of CertiPUR-US approved materials. The natural latex is OEKO-Tex certified, and the mattress won’t off-gas like others. Customers who have bought the Nest Bedding Hybrid Latex say it’s one of the most comfortable beds they’ve tried. Couples said the weren’t disturbed by their partners, and parents love the durability of the product. This isn’t our first Puffy review here on Citrus Sleep. We love that each mattress is made in the USA and that every bed is OEKO-Tex and CertiPUR-US Certified. We also love what others are saying about the bed: it’s easy to set up, perfect for any sleep position and some even say their back and joint pain has subsided. The Puffy mattress is one of the top eco-friendly kids’ mattresses because it’s safe and non-toxic. However, there’s more to love: the company gives back to children, too. Puffy donates mattresses to select children’s shelters across the United States through the #jumpforkids program. Bear Mattress is another example of a company that gives back to children. The group partners with non-profit Good Sports to provide footwear, clothing and equipment to kids who participate in school athletics. Bear has donated over $150,000 and equipment to their local youth in Jersey City, New Jersey. We couldn’t choose just one bed for our Bear Mattress review. There are two available through the company; one is a memory foam and the other is a foam and coil hybrid. Both offer great support for your kids’ bodies, but they have varying levels of firmness. The Bear Hybrid features medium support. For medium-firm support, choose the Bear Mattress. Of course, we can’t forget to mention that every Bear Mattress is made in the USA and contains CertiPUR-US Certified foam. People who have tried the Bear Mattress and Bear Hybrid say the motion isolation is second to none. Bear Mattress Coupon Code | Use code SPRING200 for $200 Off Orders $1,200+ + 2 Free Bear Pillow with all mattress and bundle orders - While Supplies Last. The last mattress on our list of the top beds for kids is our Allswell review. Allswell offers two mattress lines: the Luxe Hybrid and the Allswell. For this review, we’ve chosen the Luxe Hybrid because it’s the most supportive for your kids. The Luxe Hybrid is rated medium firm and is a foam/coil hybrid. Offering just the right amount of “bounce,” the Luxe Hybrid is safe enough even for toddlers. Crafted with CertiPUR-US Certified foam, it’s free from harmful chemicals, ozone depleters and has low VOC emissions. Every Allswell Home Luxe Hybrid Mattress is made under fair working conditions by artisans around the world. Allswell ships orders in a manner that minimizes both packaging and the carbon footprint of your order, so be sure to shop the whole catalog of pillows, throws and bedding. Whether your child is transitioning from toddler bed to “big kid” bed or you’re just looking to furnish a new home, there are plenty of safe, environmentally sound memory foam mattress and latex mattress options available. Choose from the best mattress for kids that are made in fair trade factories using non-toxic materials by shopping our list of the top eco-friendly kids’ mattresses. Many popular mattress sizes for kids mattresses are twin bunk bed mattresses, full size, and even queen size mattresses. Your children will certainly enjoy a new mattress to catch up on some zzz’s.